Staple, a U.S.-based office supply chain store, has been selling Apple products in Canada and internationally for quite some time now. Last week, their web store began offering a bunch of Apple accessories, including Apple’s own stuff as well as third-party products for the iPad, iPod, iPhone and Mac. It was their first such U.S. deal with Apple. 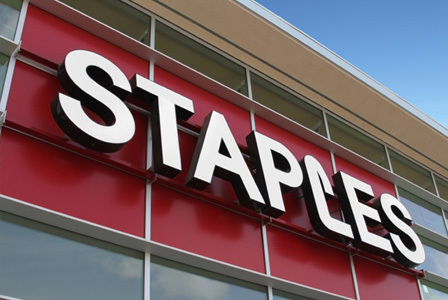 That Staples sells its office warez to buyers with business accounts doesn’t hurt either, especially given the popularity of iPhones and iPads – and Macs to a certain extent – in business environments. Reuters first reported the news, based on CEO Ronald Sargent who mentioned during the earnings call Wednesday that Apple accessories are coming to his company’s retail outlets some time during the first quarter of this year. The online Staples store offers a range of peripherals and accessories for Apple products, including mice, keyboards, Apple’s Smart Covers, the $99 Apple TV set-top box, as well as Airport Express, Airport Extreme and Time Capsule wireless appliances and lots more.